October is a breast cancer awareness month with multiple events focused on educating people about this menace of our time and fundraising for the cure. Reaching out to the community Foundry Gallery of Dupont Circle in Washington, DC, is holding an art exhibit `Feminine Essence' dedicated to breast cancer survivors. The exhibit showcases works by Russian born artist Luba Sterlikova. `It's a very personal show for me as my sister is a breast cancer survivor-says Luba - The exhibit is a tribute to courage, dedication and strength of the people who won the battle against the breast cancer'. Jenny Brake of Foundry gallery is one of those courageous women. She's been experiencing tremendous support from her family and friends that helped her to survive. `I have had such a wealth of love, prayers, caring from these people and my church that it humbles me and I know in part, my strength in dealing with this disease and treatment comes from all of the outpouring of love and prayer. This has been very powerful and a wonderful daily wonder to me and extremely healing." - says Jenny Brake. Avon Walk for Breast Cancer is one of the organizations focused on raising funds to advance access to care and finding a cure for breast cancer-helping those touched by the disease today while seeking to eradicate breast cancer tomorrow. The Avon Breast Cancer Crusade has a special focus on helping the medically undeserved, including disadvantaged, minorities, the elderly, and those with inadequate health insurance. Luba offered her art works exhibited in Foundry for a silent auction to benefit a participant in the Avon Walk for Breast Cancer. 'A portion of the evening's proceeds will help the Walk participant get one step closer to reaching her fund-raising goals... and one step closer to finding a cure!' - says Annie Weathers of the Avon Walk for Breast Cancer office in Washington. Luba Sterlikova's art exhibit is a powerful display of works featuring the symbolism of time in a woman's life and woman as a symbol of time and nature, sensuality and feminine beauty. Peter London, publisher of `Art in London' magazine writes: `A sensual energy pervades all her compositions, demanding attention and holding the viewer in thrall. 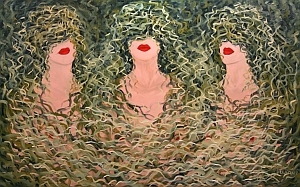 The themes of sensuality and feminine beauty are manifested in Luba's works of female nudes. The voluptuous images floating through the lush surroundings portray the evolving essence of life. The art exhibit runs October 1 - November 1, 2009 in the Foundry gallery at 1314 18th St., NW, Washington. DC 20036 with the Silent Auction on October 22,2009, 6-8 p.m.